Home Soccer "The first thing I learned in Spanish is' to score goals"
"The first thing I learned in Spanish is' to score goals"
Wu Lei, presented by Espanyol until January 2021 with the possibility of one more year, augurs immediate performance although until Wednesday, the extent of his shoulder injury will not be known. 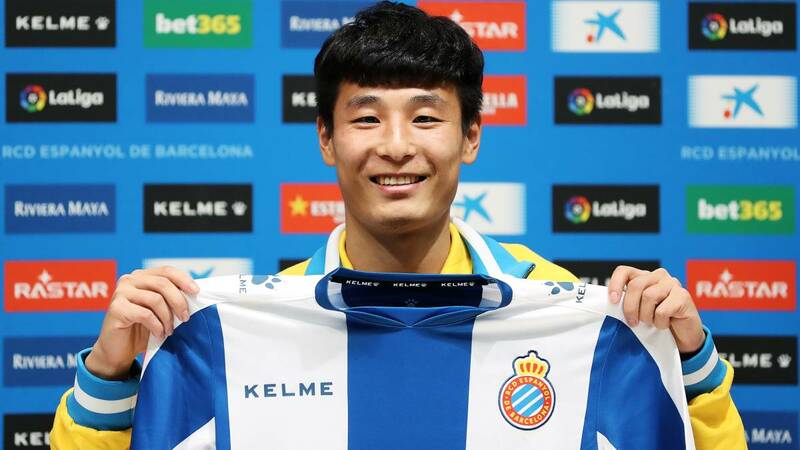 With an auditorium of the stadium of Cornellà-El Prat full, largely by Chinese informants, was presented the first footballer of that country that will play at Espanyol. Wu Lei has already signed, and has done so for st two calendar years - at the pace of the Chinese Superliga - until January 2021, with the possibility of extending one more . However, until this Thursday will not undergo a final medical review to define h to what extent is recovered from the shoulder injury suffered on the 7th day in the Asian Cup with the Chinese team. "I am very pleased to to be able to come to Spanish LaLiga and to a centennial club like Espanyol. It is a great honor and a great challenge that I want to thank the fans and President Chen, "the soccer player described, visibly shy, although he gradually let go. "When people talk to me about Espanyol, players like Raúl Tamudo come to mind. This morning they have presented me, it is a great honor, and I also have knowledge of players who identify this great club, like Dani Jarque, "he said. He added: "The fans of Espanyol are deeply rooted in the city of Barcelona. Being able to come to such a cosmopolitan city and join this great family makes me happy. " " The first expression I have learned in Spanish is 'to score goal' , and with that goal I have come, "said Wu Lei, recognized that "the final decision is pending a review that we have scheduled for tomorrow", and that it will "immediately" take classes of the local language. "Venir to Europe has always been my desire", he admitted, and explained that "now I am mature enough to face this challenge. I am aware that Espanyol has been following me for a long time, the bet that it makes for me is important. And I think I can fit very quickly in the style of game. " In that sense, and questioned if he will have pressure from China for the fact that so few players there have triumphed in Europe, he said "play where you play, there is that pressure. The pressure is the motor, which pushes me forward. I want to show in Europe to all the fans in the world that in China there are players who can do very well in the main leagues of the world. " Lei revealed that he has spoken with Zhang Chendong, who has played for three seasons at Rayo Vallecano, and assimilated that " few Chinese players have shown a great level in Europe, but I want to demonstrate mine with my own effort". Likewise, when a journalist from his country reminds him that he is nicknamed 'the Chinese Messi' and asked which goals he would like to score more goals, he said: "I do not want to compare myself with anyone. Match goals is the obligation of a striker, so I will not say which team I want to score more, because the question is to score the goals ".
" I have followed many Espanyol games. With the lack of goal it is sometimes difficult to draw conclusions, because I have seen many occasions. We will work together and they will arrive. The important thing is to create occasions, "warned the new signing, who said:" It is the first time I come to live in Europe and I am aware of the great cultural difference. I come to learn, I am open to new customs. The pace of the competition is important, but I think I'm ready for this challenge. " Finally, he agreed that "If we can fight for Europe, it would be ideal" . For his part, Vice President Carlos Garcia Pont congratulated himself: "This is another step in the development of Espanyol. Match one of the best, or the best current Chinese player puts both Espanyol and the League as Spanish football in front of a millionaire and growing audience. Although he did not give a datum of the operation "for a discretionary agreement with the Shanghai SIPG", he said that technical management and Joan Francesc Ferrer 'Rubi' have agreed to the signing and that " will have to wait for him to go out to the field once in time, because otherwise he would get bored, being what he is in his country ".
" For the club it is a great repercussion, which joins what is the Espanyol with a Chinese owner, although in the sports direction hemos thought that it will give an immediate performance, "said the director of professional soccer. El Francisco Joaquín Pérez Rufete gave by very open the market in the two days remaining until its closure. "We are always going against the clock but we will do our best to do the best we can," he said. " The market opportunity is not like an open box in which you choose, but you have something that can help you and adapt toOur economic cash, "he warned. Questioned by the possible march of Leo Baptistao precisely to China, and specifically as AS has advanced to Wuhan Zall, explained that" Leo has always been in the market because it is very attractive to clubs. There are times when offers arrive and we do not contemplate them, others we see them because they can be good for the player ". Y continued:" Let's see what happens in the next hours. He has always had good offers, but materializing it is that the other club puts on the table what interests us and that the player reaches an agreement, "he concluded.